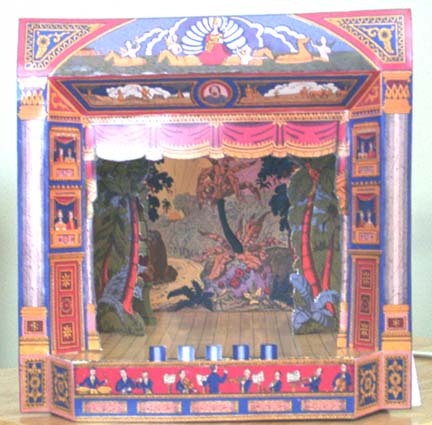 During the nineteenth century, since there was no television, children would sometimes construct toy theaters and put on their own stage productions. If you happened to watch the television program "The 1900 House," which was the first of the PBS "reality" shows, the children there made a theater. As you might expect, the theaters that the children constructed as well as the scripts that they prepared were of varying quality. 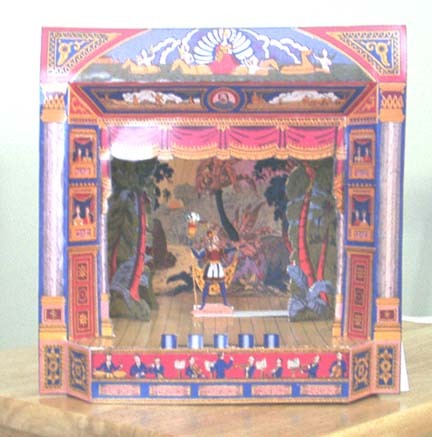 To tap into this activity, books were published with cut out paper theaters as well as paper figures for the players, scenery, and a script. The book that we have found is one of these theaters. 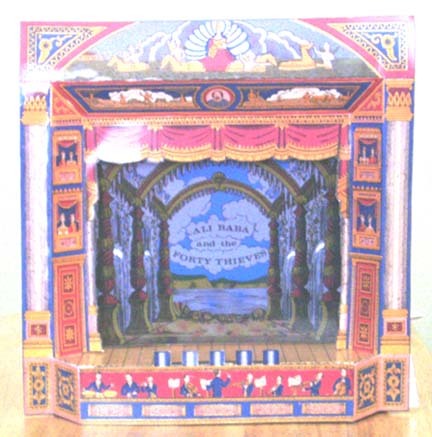 It comes complete with most of the things you will need to put on the production with the exception of strips of cardboard to fasten the players to so you can move them about the stage without a giant hand appearing. The script also calls for music so you will have to improvise as best you can for that element. We would also offer the warning that, although this project involves cutting out paper and gluing the pieces together, some of the cutting is fairly intricate and a delicate hand must be used to get the pieces folded and assembled without tearing them. Some assistance from an adult or a physically skilled older child will be required. Be sure to read the instructions because they offer hints to make the folds evenly and perform other tasks. 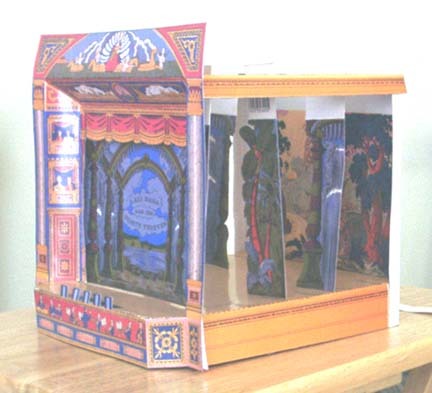 After using scissors to cut out my theater, I tried a fine hobby knife with a piece of cardboard or soft wood underneath it to cut out the figures and found it worked much better. Of course, I am an adult who is a perfectionist. For a child, they could cut the figures in a large oval shape without cutting out all the tiny indentations. Cutting out some of the scenery also would have been easier with a knife. After trying rubber cement, I found that Clear Gel Tacky Glue® worked very well. It set relatively quickly and, althought I wiped off any excess immediately, it was not so critical to get it all because it dries clear. There may be other glues that work as well or better but I stopped experimenting once this worked. To provide some idea of what the finished product will look like, I've included a few pictures of my theater. You should recognize the front of the theater is made from the front cover of the book. The first image shows the theater from an angle. You can see how some of the scenery on the sides is placed. This scenery will prevent the audience from looking out the sides of the theater during the performance. 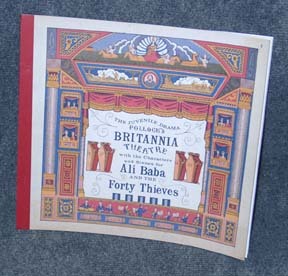 The second shows the front view with the "curtain" sheet in place (the curtain is cut from one of the pages of the book). The next picture shows the empty stage with the curtain up. You can see how the palm trees block the view out the sides and also allow entrances and exits between them. The last picture shows one of the figures that come with the book on stage, cut out and attached to a strip of poster board. From the angle of the camera, you can see the strip of poster board attached to the bottom of the figure to move it in and out on the stage. To produce the play, the children would move figures in and out as needed, change the scenery to fit the scenes, and provide the voices from the script included in the book.